A few Hershey Kisses in a cello bag tied with a cheery bit of ribbon and your favors are complete! I made quite a few of these and they go together so quickly – the fry box is VERY EASY to assemble! Just the thing for all of those last minute goodie gifts. The phrases – I used a variety of them – are from Good Greetings, the exclusive Holiday Catalog Hostess Set. The Old Olive box is stamped with the snowflakes and trees from Cheerful Greetings. Photopolymer sets are super flexible, so I was able to curve the trees in an arc to match the curve across the back of the box. The Real Red box is embellished with one of the trees from the Festival of Trees. 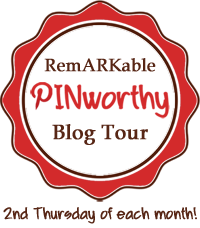 Stop by on Thursday to enjoy the RemARKable Blog Tour – our theme is Tie One On – packaging, tags and last minute gifts.